I am ashamed to say that I have never visited Naples. I have been to Sorrento and the Amalfi Coast a couple of times over the years, but the city of Naples has never been high on my radar. However, after reading ‘Colors of Naples and the Amalfi Coast,’ I have genuinely decided to visit there as soon as possible in order to rectify this appalling gap in my Italian travels. I first met Margie Miklas just a few months ago in Venice when a few of us – female bloggers on all things Italian – met up for a day making our very own carnival masks. Margie immediately struck me as a gentle, thoughtful person, totally focused on her great love of Italy and interested in everything she saw and did here. 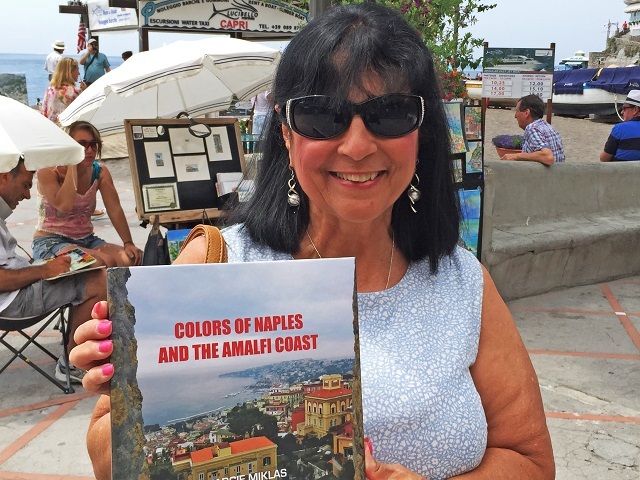 When she told me she had just written her new book ‘Colors of Naples and the Amalfi Coast,’ I asked her to send a copy to me so that I could review it. First impressions? When I slipped it from its envelope, I was greeted by a slim, hard-cover book with a lovely photograph of the Bay of Naples on the cover. I eagerly cracked it open for the first time last week and was genuinely impressed. The book describes how Margie fell in love with Naples on her first visit there, having – like me – travelled to the area many times but never having actually visited the city itself. Her delight in this fascinating and sprawling metropolis is obvious as she takes us with her on her explorations. Interspersed with her gently evocative photographs, taken with love and care, she observes daily life in the old streets and alleyways of Naples: she watches the flower seller arranging his perfect bouquets; the colourful vegetable market; a stone-mason hard at work; a silversmith working on a piece of jewellery and the frenzy of the market selling fish from the Gulf of Naples. Margie’s observations are warm and interesting. An old majolica floor-tile is photographed as she wonders about its origins; a great sense of peace is felt by her in a 14th century castle and she is amazed at how an art gallery has been incorporated into a metro station. 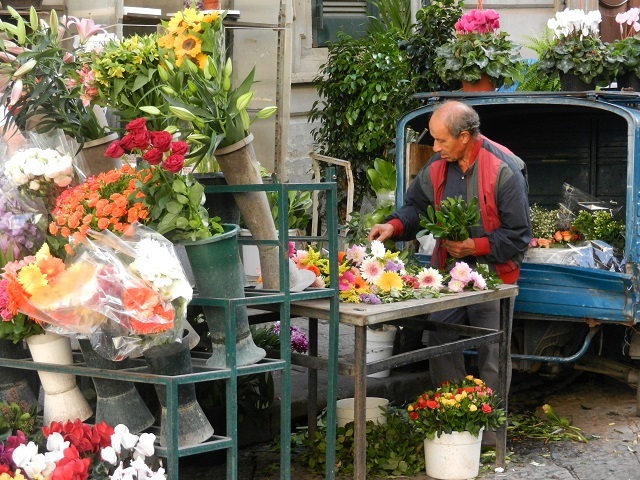 Meticulously researched, Margie has sought out the most iconic foodie places to visit in Naples. 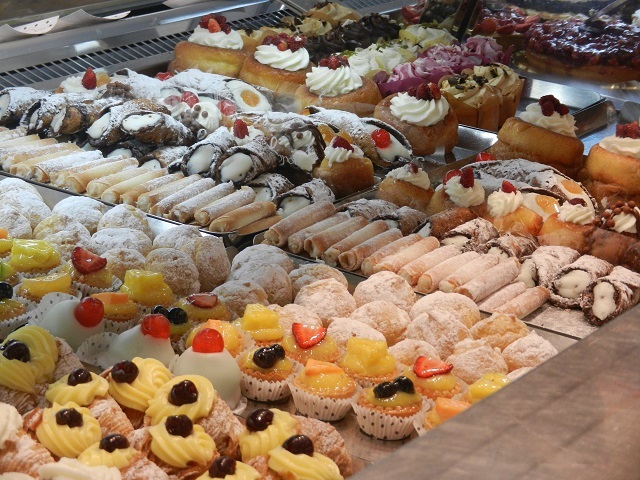 She displays a mouth-watering photo of a fantastic selection of cakes, including my favourite cannoli; describes how pizzette are made; the origins of Caffe Sospeso and also, very importantly, where to find the best gelato in town. Feeling that I am there with a real guide, I can almost taste the rum-soaked Babà Napoletana, the hand-made chocolates and the pizza made in the oldest pizzeria in Naples in an authentic wood-fired oven. On the city itself, Margie gives us her thoughts on the three mile street that runs straight through the centre and the fascinating story of the Castle of the Egg. We are even treated to a description of the funicular railway system which, she tells us, is efficiently run in this most densely populated European city. I could almost feel the hairs rising on the back of my neck as she described her visit to a church displaying human bones and skulls, while Christmas Alley sounded like a lot of fun. Margie’s section on Naples finishes with an evocative sundown photograph of the Bay of Naples, where she is almost hypnotised by all the beauty and says that the memory will stay with her forever. Next she takes us on a trip down the Amalfi Coast, where she pauses to admire the colourful bougainvillea; a pergola dripping with lemons; bottles of Limoncello in a row, plus a recipe to make it ourselves; an old water fountain in Ravello and a ceramics shop in Maiori. 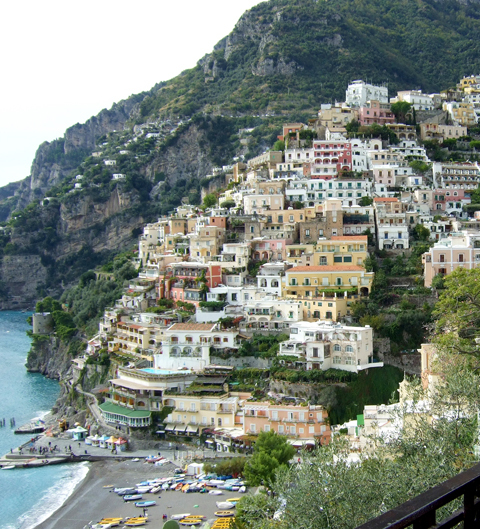 She takes us down the coast on a tantalising journey through Ravello, Positano, a Franciscan Monastery and onwards to Sorrento and Amalfi, showing us the stark cavernous rocks in the Tyrrhenian Sea near the island of Capri. She finally brakes to a standstill in Amalfi, where she revels in a creamy gelato as she strolls through the town, hearing romantic Italian music echoing from a small restaurant. Her experience is complete, for now, but I have a feeling Margie will soon be back on her Italian travels and, hopefully, with another charming and interesting book for all of us to enjoy. Enjoy! Italy is a beautiful and diverse country. Lots to see here. I cannot thank you enough, Orna for this wonderful review! I am thrilled that you enjoyed my book enough to visit Napoli and experience its magic for yourself! You gave described my book with such detail I couldn’t have done it better myself. Grazie mille! Un abbraccio! Perfectly done, Orna! Margie, you have done an excellent job captivating the heart and soul of Italy. This is one book that will be remembered for a long time. Absolutely right Susan. This is a really heartfelt book and I really mean it when I say it has inspired me to visit Naples ASAP. Ditto, Orna! And thanks I definitely will add. Maybe we can head there together sometime! Nicely done Orna, and huge kudos and two thumbs way up to the author, Margie Miklas. Thanks Tom. Yes, Margie has really pulled out all the stops with her lovely book. Lovely review, Orna, as with all of your scribbles, brava! And brava to my friend, Margie for her labor of love.